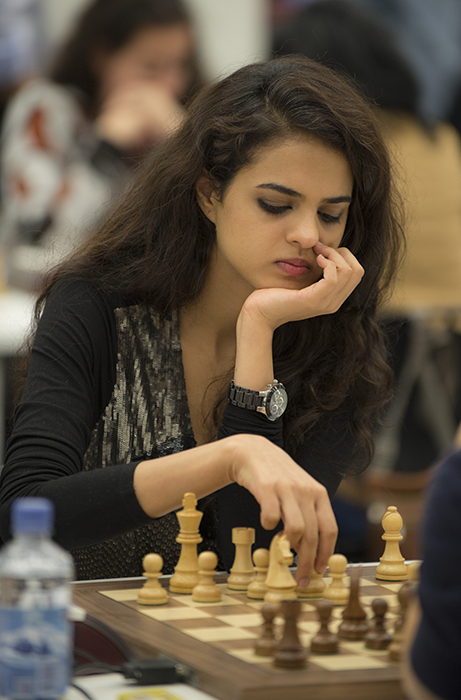 India’s IM Tania Sachdev is among the most popular female players in the world. Residing in New Delhi, she’s playing on the second board for India. The event has been somewhat disappointing for the Indian women, but a convincing 3.5-0.5 win against the Netherlands got them up to 13th place and they can still fight for the top spots. Tania Sachdev: It’s my first time in Norway and the whole of the Indian team has never been here before. It’s nice. Of course there are a few hiccups, but that’s the same for every tournament. I think everything is absolutely fine and we’re having a great time. The only slight issue has been the bathrooms, but I think otherwise I’m quite happy with everything. Tania Sachdev: I had a rest day before and then the main rest day, so I got a bit of time off. I’ve been walking around a lot and seeing a lot of things. It’s really nice, because it never gets dark here! So you can be out until 12:30, and it feels absolutely normal. It’s a bit hard to sleep, but I think it’s gotten a bit better, because we’re getting used to it. But it’s a bit unusual for us. It’s not very normal, so our team have been having a little bit of difficulties getting some sleep. Tania Sachdev: We were fifth seed, so definitely until now it has been a bit of a disappointment. We haven’t been happy with how things have gone, but hopefully the second half is going to be better. Today things look much better. So until now it hasn’t gone as expected, but hopefully things will improve! Tania Sachdev: Humpy is getting married actually! No controversies there.